Mika Rottenberg’s surreal videos reveal porous architectures, within which absurd human tasks intertwine. For example, the busy protagonists of Squeeze (2010), primarily women, produce mysterious conglomerates of mashed-up lettuces, natural rubber, and cosmetic tins in the most ludicrous assembly line. 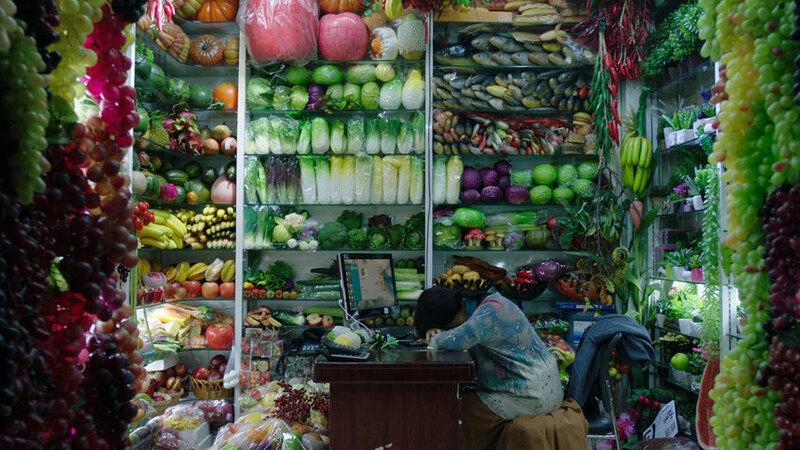 Often integrating documentary footage of actual working conditions across the world, her orchestration of nonsensical labour ultimately offers an exhilarating allegory for the commodification of people. In the age of globalized hyper-capitalism, the artist enjoys reminding us that truth is always stranger than fiction, as wacky as the latter may be. NoNoseKnows, which premiered at the 2015 Venice Biennale, creates a subtle parallel between industrialization and cannibalism through the comical mise en abyme of the manufacturing process used for cultured pearls. (Their production is accelerated by inserting tissue from dead molluscs into living oysters to provoke the precious allergic reaction.) While real pearl sorters are shown diligently working in a factory in Zhuji, China, the grotesque character of a blue-collar amazon arrives in an adjacent room filled with pretty bunches of flowers. Her curious task consists in making herself sneeze by deliberately inhaling pollen, so that she can expel an entire menu of noodle dishes, and perhaps feed everybody else on the job. Cosmic Generator, which was realized for Skulptur Projekte Münster 2017, hints at the irony behind the worldwide circulation of commodities, while people suffer increasingly restrictive migration policies. Portrayed in the huge market of Yiwu, China, bored employees almost disappear under the massive surplus of glittering trinkets overflowing their wholesale stores. On the other side of the world, American businessmen in suits attempt to illegally cross the border between the twin cities of Calexico and Mexicali separated by a long metal fence. After laboriously crawling through an underground tunnel coming straight from the artist’s imagination, they wind up in a Chinese neighbourhood in Mexico, where restaurateurs serve them like food—delicious spring rolls with coriander.